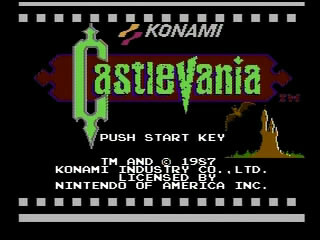 The game that launched the Castlevania series was released for NES in May 1987. Join Simon Belmont on an 18 stage quest to take down the famous vampire Dracula, and a few other famous monsters on the way. The game introduced the standard knife, axe, holy water, stopwatch, and boomerang special weapons used in many future games. Best time: 0:11:48 by 'kmafrocard' on 2013-12-15. After hundreds of attempts, this is the result of dedication and some decent RNG. There are slight improvements in levels 1-5 compared to Funkdoc's 12:06 run, but the crème de la crème of this run is 1st form Dracula. There were a few different strategies used and RNG occurrences in levels 1-5 that I will point out. Level 1: I grab the dagger on the opening screen to ensure that I will have a 0 heart count at the end of the level. It does cost slight time (0.1 seconds), but is worth it to ensure no heart count off at the end of the stage because with bad luck, I could pick up 2 additional hearts that I would not be able to dump without a lucky weapon drop. I was fortunate enough to have good luck and not take a hit from a Zombie while ascending up the stairs in the 1st room which saves about 0.25 seconds. The boss fight is something to behold. I had poor luck with the amount of time it took the bat to swoop down, so unfortunately the critical hit glitch did not save any time compared to the previous version's axe quick kill. With a quick swoop from the bat, this can actually save up to 2.5 seconds compared to the axe method. Level 2: The only difference of time in this stage compared to the previous run is the crushers in the 2nd to last room before Medusa. I was able to find a way to walk under the crushers without having to stop. It takes timing and location to manipulate the crushers, but this saved about 1 second compared to the previous method as far as I can tell. I had bad luck getting hit by the Bone Pillar's fireball, but unfortunately those are RNG based. I could have waited on the left side of it to shoot the 2nd fireball, but would have wasted as much, if not more time than just taking the hit. The Medusa fight was average. There is a better pattern that is luck based that would have saved an additional second. Level 3: The only notable difference compared to the previous run is that I boost off the Bone Pillar in the 4th room. I do this as the previous run had a slight pause before the bone pillar to avoid getting hit and takes time to throw a cross after the jump. With the boost, I can throw the cross from the crouching animation (which is unavoidable after a hit taken not on stairs) which makes up for the lost time taking a hit since the previous strategy threw a cross anyways. The mummy fight went well and I'd say overall, I saved maybe 0.5-1 second compared to the previous run on this level. Level 4: 2 words: Axe Drop. Axe drops in the area with Harpies dropping Fleamen destroyed countless runs for me, but obviously not this one. The bat boost is a really cool trick and takes pretty precise timing with the stop watch to manipulate when/where the bat will spawn. Overall, there is no improvement to this stage compared to the previous run and there probably never will be unless someone decides to utilize the critical hit glitch on the Frankenstein monster. Level 5: There are no improvements to the previous run. I was able to get good luck by the 1st skeleton not throwing a bone. The 2nd damage boost could have been faster with better luck as sometimes that skeleton will throw a bone quicker which would save about 0.5 seconds. Other than that, this level is probably the most consistent level to speed run as the only real luck encounters are the 2 skeletons mentioned. The only significant improvement that can be made to this stage would be to utilize the critical hit glitch on Death. Level 6: This is where almost all the time is saved compared to the previous run. The level is identical up until the point where I go to grab the meat. There was an unfortunate Fleaman in my way which cost about 0.25 seconds. The meat is necessary to be able to have enough health to perform the Dracula strategies I use. I could avoid the meat and suicide, but there's a risk to not have enough hearts for 2nd form Dracula and picking up both whip upgrades costs time as well. Also, who wants a run where you die :P.
The Main Event: First form Dracula did not go according to plan. I typically utilize the critical hit glitch on the 1st cycle of Dracula, use the 2nd cycle to grab the Holy Water and Double shot and the 3rd cycle to whip once and land a 2nd critical hit. I had operator error as I neutral whipped on my 2nd whip of the 1st cycle. Typically, if performed right, I can take 9 bars of health on the 1st cycle with the glitch. So with the error, I had to improvise. Dracula can somewhat be manipulated as to where he will spawn by your movement and location but is definitely not 100%. I was able to manipulate the 2nd cycle to be in a position to attempt a critical hit without whipping the candle where the II would appear. Once again with manipulation, I was fortunate enough to be to the left side of Dracula without worrying about whipping the candle too soon. I was able to land the 2nd critical, get boosted underneath the candle, throw the cross and pick up the Holy Water and II. 2nd form Dracula is easy with double Holy Water. If I would have jumped and tossed the holy water, 2nd form never would have moved. It worked out well though as once Dracula was stunned; he was crouching so the holy waters crossed his hit box thus damaging him faster. This was actually the fastest Level 6 I ever had in a run despite the errors that were made. Overall, I am extremely pleased with this run. There is probably another 3-4 seconds to be saved with perfect luck but since 11:50 was my goal, 11:48 is icing on the cake.